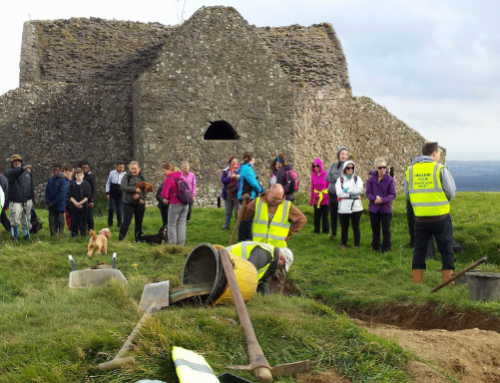 Welcome to our site diary; read on to discover the latest findings from the Hellfire Club Archaeological Project Week One (Tuesday 04th October – Friday 07th October 2016). We are carrying out a small dig on what is believed to be a large 5,000 year old passage tomb that was largely destroyed when William Conolly had the Hellfire Club built originally as a Hunting Lodge in around 1725. For more about the Hellfire Club – click here. With the excavation we hope to establish just how much of the tomb survives, and if possible, to retrieve some bone or charcoal from a prehistoric context so we can radiocarbon date the site to find out exactly how old it is, and to help compare it with other passage tombs like Newgrange, Knowth or other passage tomb cemeteries like Carrowkeel in County Sligo. Since we started digging on Tuesday (4th October), we have opened a 15 metre by 2 metre trench across the tomb to look at the preservation and to get a sense of the type of soils and contexts. We are excavating everything by hand, using spades, shovels, mattocks and trowels, so it can be a slow and painstaking job. In the uppermost layers, as you can imagine, we found lots of evidence of people picnicking and partying through the years, but amongst the beer cans and plastic rubbish we also found some nicer finds, like a clay tobacco pipe from around the 1850s that has a bird’s claw (or perhaps a dragon’s claw if you’re a Game of Thrones fan). You can still see the maker’s mark on the stem so hopefully we might be able to discover what factory made the pipe and when. As we progressed with the dig, we discovered that the large mound that you see so clearly in the aerial photographs, is actually man made. It looks to have been constructed of layers of large stones and earth. We’re still at an early stage with this feature, so we hope to have a better understanding by next week. That stony layer that you see near the end of the trench appears to be the stony covering of the cairn that has slipped down the mound. It’s quite a mixed context, with some more modern finds within it, so it may partly be the result of the disturbance of the tomb. We also found waste fragments from the manufacture of stone tools, consistent with what you might expect from site that dates to the Neolithic period, the time of Ireland’s first farmers who lived over 5,000 years ago. This was a pre-metal age, so the main tools would have been made from organic materials like wood, bone, sinew and leather and stone like flint or chert. The organic material often does not survive such a gulf in time, so we are often only left with the stone tools, or occasionally, fragments of pottery. The weather has been extremely kind to us, as has the large number of locals who have stopped by for a chat and to see what we’re doing. A number of the local schools have also paid us a visit, like Rockbrook Park and Ballyroan Boys’ National School and we’re looking forward to helping Tallaght Community School in their project to uncover the stories and folklore about the Hellfire Club. Please do come and visit the Hellfire Club for a tour of the archaeological site. The Hellfire Archaeological Project is carried out by Abarta Heritage and volunteers from UCD School of Archaeology with funding by South Dublin County Council and support from Coillte and the Dublin Mountains Partnership. Please do come up and visit the dig to discover our latest findings, we’re on site from Monday – Friday from 9am – 4pm. You can also keep up with us here on our website. Neil is the managing director of Abarta Heritage. Neil is an experienced and licensed archaeologist who has excavated sites all over Ireland. He has authored many articles and publications to help promote Irish heritage, and has recently authored a guidebook for Ireland’s Ancient East for Collins Press. He is a member of the Royal Society of Antiquaries of Ireland, and a board member of the Institute of Archaeologists of Ireland. Neil is passionate about helping to tell the story of Irish archaeology, history and culture in accessible and engaging ways. A bit of Histoey of the site.The remains of the prehistoric monument that originally stood at the summit can be seen to the rear of the Hell Fire Club building. Austin Cooper, on his visit in 1779, described it thus: “behind the house are still the remains of the cairn, the limits of which were composed of large stones set edgeways which made a sort of wall or boundary about 18 inches (46 centimetres) high and withinside these were the small stones heaped up. It is 34 yards (31 metres) diameter or 102 yards (93 metres) in circumference. In the very centre is a large stone 9 feet (2.7 metres) long and 6 feet (1.8 metres) broad and about 3 feet (0.91 metres) thick not raised upon large stones but lying low with the stones cleared away from about it. There are several other large stones lying upon the heap.” It appears from this description that the central chamber of the monument – which was a passage grave – survived intact even after Mount Pelier was constructed. The historian Peter J. O’Keefe has suggested that many of the stones were taken away and used in the construction of the Military Road at the start of the nineteenth century. Today, all that remains is a circular mound 15 metres (49 feet) in diameter and up to 2 metres (6.6 feet) high with a dip at the centre where the chamber was located. The four large stones at the edge are all that survive of the kerbstones that formed the boundary of the monument. In close proximity is a second mound, 1 metre (3.3 feet) high, on which an Ordnance Survey trig pillar stands. Close to the monument is a fallen standing stone, a pointed rock 1 metre (3.3 feet) high. As a volunteer Ranger with the Dublin Mountain Partnership (www.dmp.ie) we organise free guided walks / hikes in the Dublin Mountains and on the Dublin Mountains Way (www.dmw.ie) The Hellfire Club would be a hiking route we would bring groups to. So having this information on the history is great and will make our hikes more interesting. Keep up the good work and look forward to your up dates. Really interesting information, i’m looking forward to reading more! When does the dig conclude? I’ve a couple of days off coming up and would love to pop up. Thanks for your comment and your interest in the excavation. The dig is finishing up next week so if you are free, we recommend visiting early in the week before the trenches are backfilled.